From time to time, unfortunately items can get damaged or vandalised. We provide commercial climbing frame accessories as replacements for your Hy-land commercial swingsets. Choose from additional swing seats, and nest swings to replace those that have been stolen or damaged. 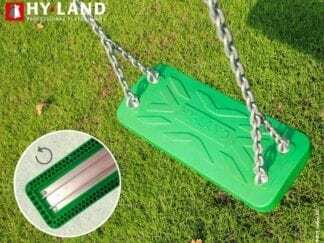 You can also order additional ground anchors to give greater stability and security for your swingsets. For extra safe securing and anchoring of your swingset, extra ground anchors are available to order, supplied in pairs. 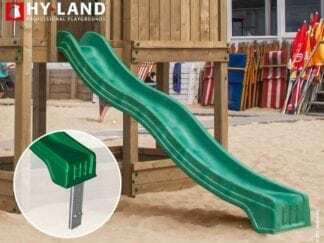 The Hy-Land slide is made of strong HDPE polyethylene and is designed for the Hy-land platform. Outdoor playset accessories are extensively tested for safe playtime and are ideal for public playgrounds. Made for a platform height of 1.5 metres, the length of the slide is 3 metres long. 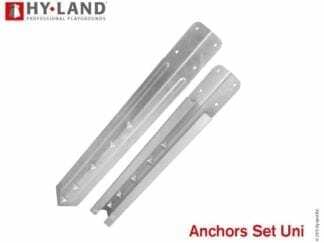 The Hy-land slide comes including all fixing / anchors required to enable you to affix it to the platform. The highly durable commercial swing seats are of HDPE polyethylene and built to be resistant to degrading and sun-fade. 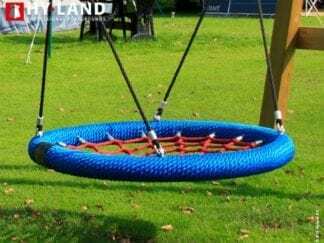 The replacement nest swing is made of a steel core wrapped in shock – absorbing rope with nylon bearings. Measuring a total diameter of 1 metre, it’s big enough for 2 or 3 friends to share. Perfect as park swing set or as part of the school equipment. The Hy-land stainless-steel slide can be ordered as part of a climbing frame or as a separate accessory. Built of stainless steel it is highly attractive, complementing the wood finish of the climbing frame beautifully and stays shiny all year round. Need Help Buying a Climbing Frame? Creative Garden Supplies Ltd is registered in England and Wales No. 08121331. VAT No. 153932505. Trading address Unit 31a, M1 Commerce Park, Markham Lane, Chesterfield, S44 5HS. Creative Garden Supplies LTD acts as credit broker/intermediary and not as a lender. Credit products are provided exclusively by Klarna Bank AB, which is authorised and regulated by the Swedish Financial Services Authority, with limited supervision by the Financial Conduct Authority.